Days and dates: Thursday, Friday & Saturday: February 1 – 2, 7 – 9, 14 – 16 and 21 – 23. OBS: Canceled if it rains or is snowing! 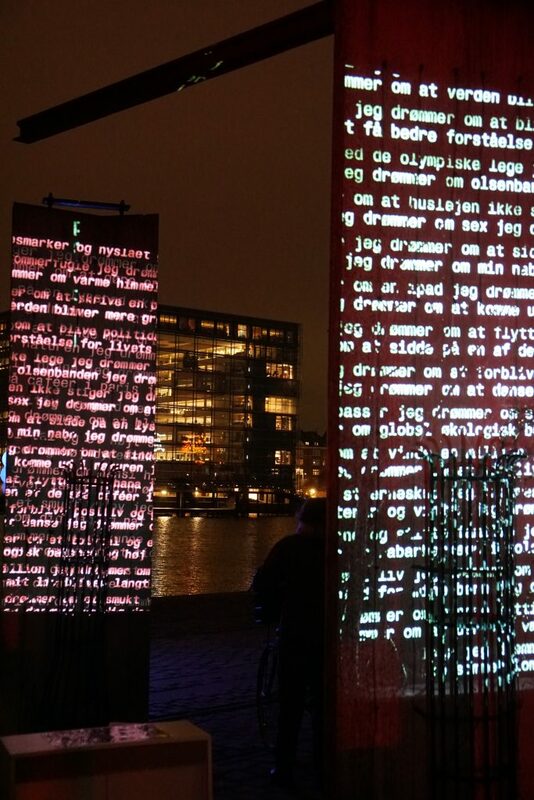 A video- and light project by Morten Søndergaard and the residents of the city, located by the waterfront at Islands Brygge. I dream about the smell of yellow rapeseed fields and freshly mowed lawns, I dream about Hansi Hinterseer, I dream about starting over again, I dream about rhubarb cake in the sun. The installation is a continuation/further development of a gable in Valby. On Islands Brygge the scripted dreams will float on 10 monoliths that are already part of the waterfront’s architectural expression. The dream poems will be illuminated and enhanced by colour and movement, and the monoliths/concrete walls will appear as gleaming objects, emerging from the ground. By use of different colours, they will slowly change, allowing the viewers to focus on the dream poems. Morten Søndergaards “Dreams” will read his poems on the opening event at February 1 when Kulturhuset Islands Brygge opens all their light works in Copenhagen Light Festival. Palle Vedel is involved in almost all of Kulturhuset Islands Brygges projects in Copenhagen Light Festival. Besides realizing Morten Søndergaards Dreams in Islands Brygge, he is helping Zhang Xiaotao realizing her video project Sickee no. 2 as well as making a video event LOOP together with Peter Martensen on February the 1. More info on Kulturhusets opening event here. Information om Kulturhusets åbningsevent findes på dansk her.